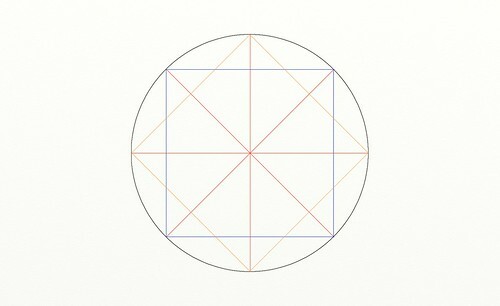 Why should one want to draw a perfect circle, if one can just get a pair of compasses and be done with it? The answer is: because it is so hard to do. 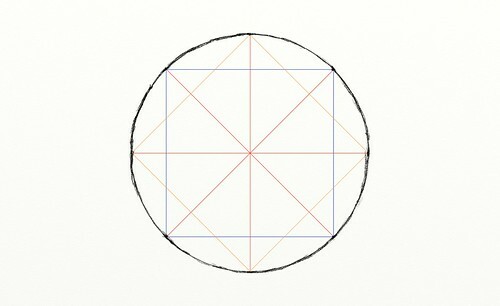 Next, I copied the eight corner points of the two squares inside the circle in a new layer, so I had eight points to guide me drawing the circle. I made the “perfect circle” layer invisible and tried to connect the points. 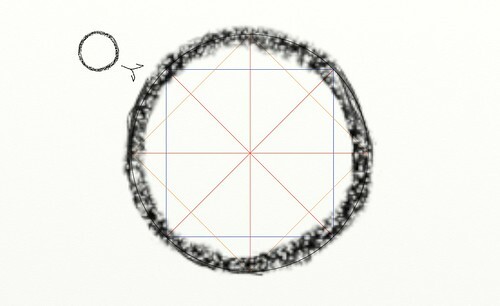 I made the “perfect circle” layer visible again, to check how I did. Not too bad. 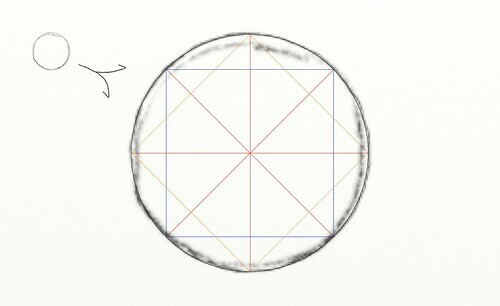 Then I kept the “perfect circle” layer visible, zoomed in on the image, and started to trace the circle in a new layer, drawing from one point on the circle to the other, keeping track if I was still exactly on the circle. This required an enormous amount of concentration, because I had to keep track of several things at the same time, the end points, the curvature of the circle underneath, how the Wacom tablet stylus reacts to my hand movement, etc. I got a good feel of how it is if you don’t have a tracing image to guide you. Next, I tried to use this just acquired skill of drawing with intense concentration to draw a circle without guidance in a new layer, just from memory. 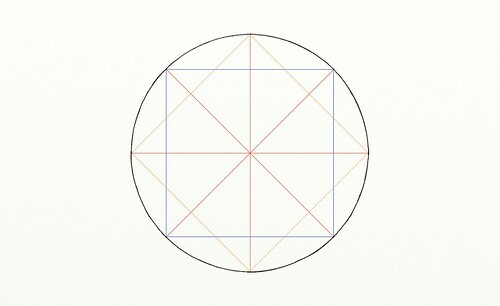 To compare, I blew it up in a new layer, and merged that with the layer I drew my freehand circle. Now I could see what I’ve done wrong, I repeated the process, now with a crayon instead of a pencil tool. And the circle was even better than before. Of course, a circle is nothing else that a curve with points that are equal distance to a central point (called the center point). So, in principle, you could draw a point as the center point, and draw the curve as described. However, there is the tendency in human beings to judge height more important than width. This means that if you drew a square without realizing that, you actually would draw a rectangle that is less tall than high. You need to work around this “intuitive knowledge”, because it doesn’t help you. One way is to rotate the piece of paper (or digital canvas, if your application allows it), and only draw in one dimension (left to right). The problem with that method is that you can’t compare several parts of your drawing, only those parts that are left and right of your center point. I think a better solution is to keep the same distance from the center point, not turning the paper, and, in your imagination, draw radial lines that are of a fixed length. The curve has to be perpendicular on those imaginary line pieces. This requires a lot of concentration, and even more practice. That is why I can’t show it to you here, yet. Anyway, drawing a perfect circle, as described in the latter method, requires the same fine tuned hand coordination you need for drawing from life. You shouldn’t have to think anymore about how to draw shapes, because if you do, you’d concentrate more on your drawing than on your subject. If you followed my blog, you’d know that is one of the bad habits of newbies at drawing. Drawing should come natural. To reach that stage, you have to work really hard.